Or he will be when Issue #36 of “Life with Archie” hits stores in July. That’s the word from CNN and Archie Comics CEO Jon Goldwater, the son of the comics’ creator. Apparently Archie, always the nice guy at Riverdale High, dies saving a friend. Now, I read a lot of Archie Comics as a kid…so I was super sad when I first read the news. 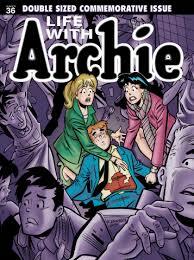 Then I found out that the “Life with Archie” series has been telling stories about Archie’s possible ‘future lives’ and ends, appropriately enough, with his death. The regular Archie Comics set in his teenage years at Riverdale will continue on. Umm…that seems like a bit of a cheat. Or maybe a stunt to get some readers like me back who don’t know the difference? Archie — say it isn’t so. Oh wait, you’re dead. Well, one version of you is dead…or will be soon. I’m so confused. This entry was posted in Comics, Commentary, Entertainment, Humor, Magazines, News, Summer and tagged Archie, Archie Comics, Archie is dead, CEO, cheat, CNN, comics, commentary, death, entertainment, friends, future lives, Humor, Jon Goldwater, life, magazine, news, review, Riverdale High, say it isn't so, stunt, summer, teenage years. Bookmark the permalink.